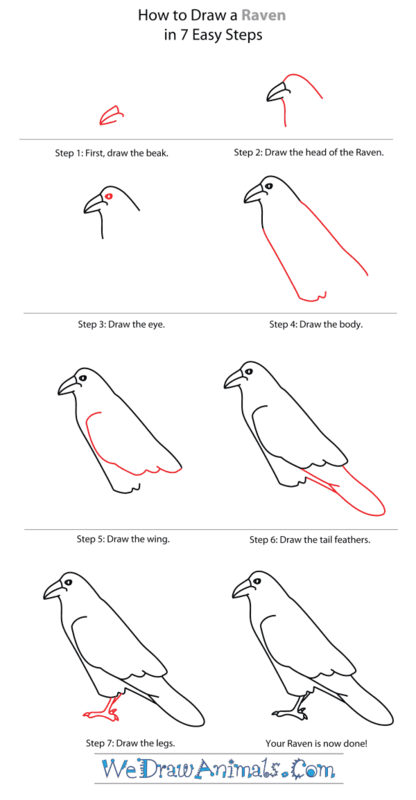 In this quick tutorial you'll learn how to draw a Raven in 7 easy steps - great for kids and novice artists. At the bottom you can read some interesting facts about the Raven. 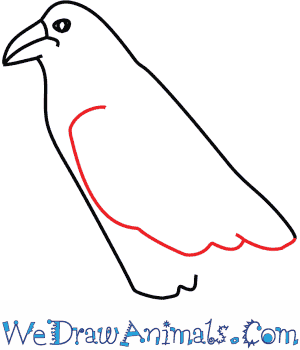 Step 1: Let's start our Raven by drawing the beak first. 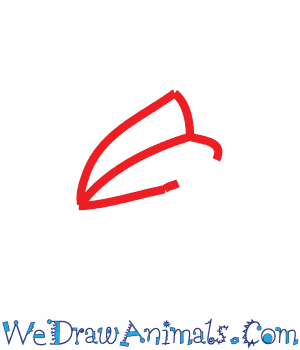 Draw two triangular shapes that meet at the end. These birds eat a lot of different things: insects, berries, fruits, grains, and even small animals! Step 2: Now, add a curved line on the top for the head, followed by a line straight down for the neck. Step 3: For the eye of the Raven, draw an almond shape with a small circle inside. The Raven has a keen vision to hunt prey. Step 4: Now, let’s draw the body. 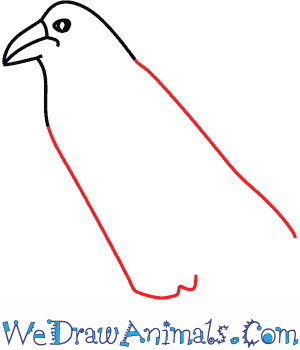 First, draw a long line down the back of the Raven for the back. Then, make another straight line down from the left side, but bring it back in towards the middle. 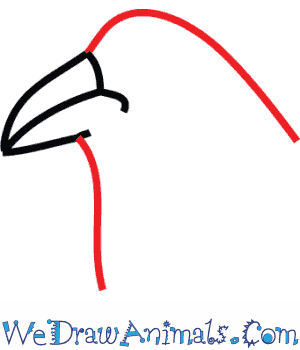 Step 5: Add the wing on the Raven by bringing a couple of round shapes to create the feathery wing tips. 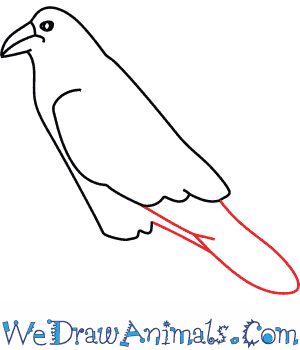 Step 6: To draw the tail feathers, make another long round shape at the very bottom connected to the body by a few straight lines. 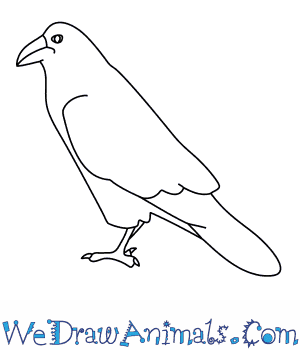 Step 7: To finish drawing the Raven, let's add the feet down at the bottom. First, draw a few short lines straight down, and then add the two round ends. Finally, add a few small cones for the sharp talons! 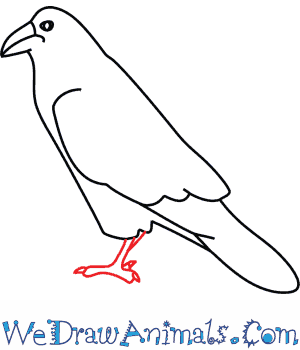 Color the Raven black with white feet. The Raven is a well-known all black bird. There are eight different types of this bird, even though they all look very similar. Ravens are passerine birds, which is a classification of bird that includes around half of the whole population of birds! One way to be able to tell if a bird is a passerine bird is by looking at its feet: it has three toes pointing forward and one toe facing backward. The raven is possibly the heaviest of all passerine birds! Ravens can live up to be 21 years old! Unlike some types of birds, ravens have only one mate for life with which they find their own territory that they defend as theirs. Even though ravens are all black, their eggs are a pretty blue-green color! These birds eat a lot of different things: insects, berries, fruits, grains, small animals, and even food waste; which makes them successful as a species because food is easy to find! In many different cultures the common raven is thought of as spiritual figure or even a god, partly because of how unusually intelligent these birds are! 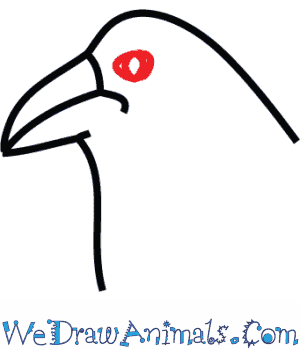 Ravens have also been the subject to make different types of art, mythology, folklore, and literature.